1. Install utorrent, the torrent software on your Windows system. 2. Go to official Fedora site to download Fedora 14 at http://fedoraproject.org/get-fedora-all. 3. Download the torrent file for Fedora 14 http://torrent.fedoraproject.org/torrents/Fedora-14-i386-CDs.torrent, save this file to your local hard disk. 4. 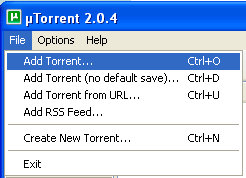 Open utorrent software and click on menu File and click on Add Torrent. 5. Locate Fedora 14 torrent file that you save earlier and then open torrent file Fedora-14-i386-CDs.torrent by click and highlight the torrent file and click on Open button. 6. Choose location to put Fedora 14 on your hard disk and click OK button to start the downloading process... but please make sure that you have enough empty space on to accommodate the Fedora 14 file..
7. Torrent Fedora 14 start... and as usual you have to wait for torrent software to finish downloading all the Fedora 14 file before you can burn the Fedora 14 to the installation CDs. 8. But before you burn the Fedora 14 installation disc please check the sha256sum for Fedora ISO image before you burn the ISO image to DVD or CDs.